I purposely followed up with this particular album. It was another guitar instrumental album (Yngwie’s is mostly instrumental, so knock it off ya nitpickers) from the 1980s. 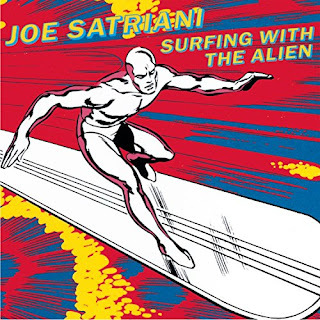 I was aware of Joe Satriani because I had his ‘Not of this Earth’ before the leaps ahead ‘Surfing with the Alien’ album. Since I heard that quite a few of the guitarists that I liked were actually taught by Satriani, I wanted to hear him for myself. When ‘Surfing’ came out I was floored. And that wasn’t the reaction that I had with the previous release. So you can definitely say that Satriani didn’t suffer from the “sophomore slump”. And sadly, no other releases quite reached the heights for me personally. I got to see Satriani touring for ‘Surfing’ in Raleigh at the Rialto Theatre WITH Stu Hamm on bass. Hamm is an AMAZING bass player. I’ve also seen Satriani at a G3 show a few years ago with Steve Vai and Yngwie Malmsteen. That was an amazing show as well. ‘Surfing with the Alien’ has the subtlety and finesse that ‘Yngwie Malmsteen’s Rising Force’ lacks. Satriani isn’t flash. He strives to give the melody meaning and feeling whereas Malmsteen seems more concerned with how many notes he can get into a measure. But when the gear needs to be kicked into flash, Satriani has more than capable fingers. This is a great album for guitarists and it’s a good album for non-musicians looking for something to mingle into the background that may perk up an ear or two. I’ve personally seen the album spark good conversation about guitarists. I’m still keeping up with Satch now that he’s a member of Chickenfoot. ‘Surfing with the Alien’ is a must have for ANYONE. Yes. Anyone. Short and sweet. You must have.